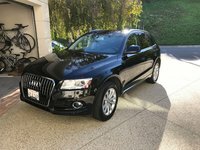 Need a small SUV with some serious pep, a few nifty moves and a carload of entry-level luxury features? Check out the 2013 BMW X3, due in showrooms this May. Designed with the mid-size family in mind, this 5-passenger crossover comes in two trims, the xDrive28i and the xDrive35i, and each now boasts a turbocharged powertrain, all-wheel drive (AWD), a few upgraded amenities and 63.3 cubic feet of cargo space with the rear seats folded. For 2013, both trims are delivered with a standard power-opening rear liftgate, standard four-mode selectable Driver Dynamics Control and an available Driver Assistance Package with lane departure warning, auto high-beam control and, for the xDrive35i, a color head-up display on the windshield. Additionally, the xDrive28i now comes with a new turbocharged 4-cylinder powerplant and standard 18-inch alloy wheels, and its available M Sport Package is tweaked to include 19-inch alloy wheels, a body kit and sport front seats. Once again, Beemer’s high-end crossover will contend with the likes of Infiniti’s similarly agile and less expensive EX35, Mercedes-Benz’s solidly staid GLK 350, the family-friendly Volvo XC60 and Audi’s buttery smooth Q5. Beauty, brains and brawn are in the eye of the beholder, however, with the X3 well equipped to hold its own. 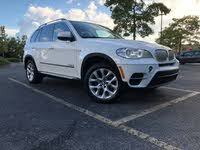 Doubtless the most noteworthy upgrade for the 2013 X3 xDrive28i is a turbocharged 2.0-liter inline 4-cylinder (I4) engine that replaces the normally aspirated inline 6. This new turbo four-banger pumps out the same 240 hp as the V6 while jacking torque from 221 to 260 lb-ft. The responsive 8-speed shiftable automatic transmission, with its heady manual shifting mode, stays, and the xDrive system—Beemer-ese for “intelligent” AWD—remains under the management of a mechanical center-mounted limited-slip differential. The xDrive system features rear-wheel-drive (RWD) agility until the system detects slippage, when torque gets transferred instantly from the wheels that slip to the wheels that grip. Descent control, the brake hill holder feature and the ability to haul 3,000 pounds of trailer when properly equipped remain standard with the new turbocharged I4, while the now-standard Driver Dynamics Control system adds an efficiency-oriented Eco Pro mode to the Comfort, Sport and Sport + selections of yesteryear. Needless to say, mileage figures are as yet unavailable for the turbo I4. The xDrive35i, meantime, continues to carry the 300-hp turbocharged 3.0-liter inline 6-cylinder (I6) engine that made it, well, quasi-famous anyhow. The 8-speed shiftable automatic graces this powerplant as well, and allows an impressive 300 lb-ft of torque. With direct injection (DI) and variable valve timing (VVT), once again look for 19 mpg city/26 highway from this impressive I6. Both X3 engines, additionally, now sport standard auto stop/start technology, whereby the engine shuts off at a stop and restarts when the accelerator is pushed, thus marginally easing the gas budget. But the X3 will accept only premium unleaded fuel. Once again, the X3 xDrive28i shouts posh with such features as a standard power rear liftgate and upsized 18-inch alloy wheels debuting for the 2013 model year. A rear spoiler, power-adjustable front seats and leatherette upholstery, meantime, return for an encore, along with such reprised goodies as remote power door locks, power windows, heated power-adjustable outside mirrors, telescoping tilt-wheel steering and cruise control. Dual-zone climate control, of course, as well as a leather steering wheel, alloy and leather cabin accents and memory for two drivers' settings also remain standard for 2013. Entertainment bling, meantime, should again consist of a 205-watt audio system with MP3-capable single-CD player, 12 speakers and a USB connection, while Bluetooth hands-free technology is once more expected to ease communications. The 2013 X3 xDrive35i, meanwhile, should also sport the standard power liftgate while retaining the standard power sunroof and upgraded cabin accents, including genuine wood trim. Options remain pretty much as they were last year, though the xDrive28i’s M Sport Package sports some added glitz, and both trims now qualify for the newly available Driver Assistance Package. Further notable options, meanwhile, remain heated front seats, a heated steering wheel, hard-drive-based navigation, BMW Assist with upgraded Bluetooth and USB, and BMW Apps for limited iPhone-interfaced internet service. Finally, front and rear parking sensors, commonly known in Beemer-land as Park Distance Control, also makes the list of noteworthy optional amenities, as do an upgraded 16-speaker audio system, satellite radio and a rear-view camera with Beemer’s unique Top View feature. Look for 4-wheel antilock brakes (ABS), traction and stability control, front and rear head airbags, active front headrests and front side-mounted airbags to continue bearing the brunt of the occupant safety chores in the 2013 X3 lineup. Daytime running lights and front fog/driving lights will also remain standard, as will emergency braking preparation, brake drying, a post-collision safety system and a remote antitheft alarm. The popular xenon adaptive headlights remain a safety option, as do emergency service communications and stolen vehicle tracking via BMW Assist. 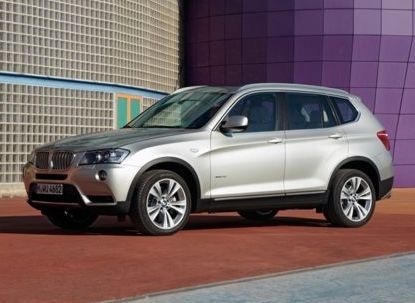 What's your take on the 2013 BMW X3? Users ranked 2013 BMW X3 against other cars which they drove/owned. Each ranking was based on 9 categories. Here is the summary of top rankings. 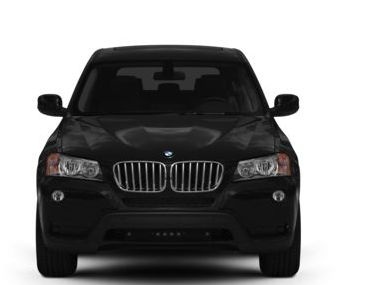 Have you driven a 2013 BMW X3? 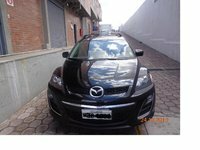 I found and bought a car through your web site. How do I get history on that vehicle that was posted here? Does The 2013 BMW X3,x Drive Have Blind Spot Detection? How do I go about getting ahold of bmw , 2013 x3 28i 78000 on it just started knocking really load. Tire Size recommended is 245/50 R18. Can I have a set of 245/45 R18 installed without causing any problems?